One Sleepy Night is the story of how recently retired, Grandpa Benny Wilson, discouraged about life and struggling in his marriage, tells Suzy, his granddaughter the real story of Christmas and in the process unites the family in joy and hope. The show is structured as a play within a play. We go from modern day back to the ancient world and then back to modern day again. Grandpa has been getting kind of reclusive. He hides away with his telescope looking at the stars. Grandma thinks he’s getting far too sullen and spending too much time day-dreaming with his "head in the clouds." The remedy she believes is for him to get out more—with her—and she’s determined that this Christmas is going to be the turning point. Well, while Grandma’s off shopping with her daughter, Margaret, son-in-law, Jason, and three sons, John, Thomas and Daniel, Grandpa is left at home with Suzy, the youngest of the sibs. Their responsibility is to decorate Grandma and Grandpa’s Christmas tree before everyone returns. Early on we hear Grandpa's point of view about the need to have a "broader vision." Somehow, though, now that he's getting older, he finds himself wrestling with the meaning of his life and not quite capable of reaching for the stars. He's brought back into the moment when he learns that Suzy has the whole story of Christmas mixed up. He begins to set her straight when all of a sudden, as they look through the telescope, everything transforms. 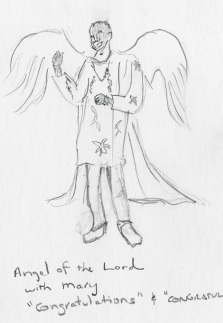 Back in antiquity, we meet The Angel of the Lord accompanied by a choir of breakdancing angels, a teenage girl and her true love, Kaspar, the head wise man, played by Grandpa, and his determined wife, Mrs. K, played by Grandma, a bunch of stars and some shepherds. When a special discovery happens at a manager, we return back in time to the house and find that Grandpa and Grandma have made a journey of their own that leads the whole family to a joyful ending of One Sleepy Night.